UFC Nashville went down from the Bridgestone Arena in Tennessee earlier tonight (Sat. March 23, 2019). On the ESPN+ preliminary card, Randa Markos defeated Angela Hill in impressive fashion. Markos scored a spectacular first-round armbar submission over Hill. She was awarded a $50,000 Performance Of The Night bonus for her effort. Also, on the ESPN+ preliminary headliner, Bryce Mitchell and Bobby Moffett put on a tremendous featherweight bout. Although Mitchell took home the unanimous decision win after three rounds, both men received $50,000 Fight Of The Night bonuses. 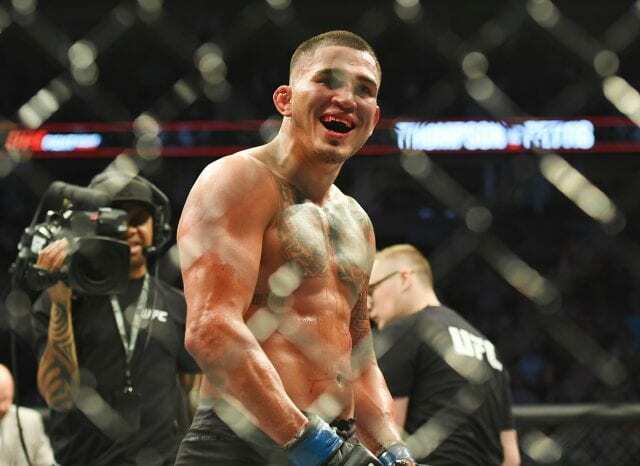 Finally, in the main event, Anthony Pettis scored a ridiculous knockout. The former lightweight champion finished two-time welterweight title challenger Stephen “Wonderboy” Thompson in the second round. He rendered Thompson unconscious with a Superman punch while bouncing off the Octagon cage. He’ll also take home a $50,000 Performance Of The Night bonus for the finish.